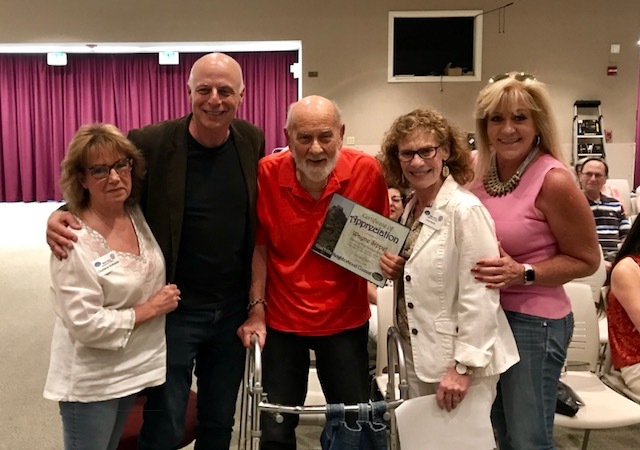 When he visited last Thursday's meeting of the West Hills Neighborhood Council, Highlander Road resident Wayne Sippel didn't know he was going to be the center of attention. So you can imagine his surprise when WHNC Board Member Faye Barta — herself a leader of the Highlander Road community — led a presentation of the council's Certificate of Appreciation to Wayne for his successful efforts in securing a potentially life-saving traffic signal at the intersection of Highlander... and Valley Circle Boulevard. The certificate describes Wayne as a "Hero of Highlander Road." With WHNC Vice President Char Rothstein and yours truly standing beside her, Faye described Wayne's tireless efforts over the course of several years to correct the sudden removal of a stop sign at the intersection when the city installed a light signal further down Valley Circle at Bell Canyon Road. The new signal will change from green to red only when activated by a car or pedestrian preparing to enter Valley Circle from Highlander Road. Furthermore, the light is programmed so no cars on Valley Circle will have to stop at both Highlander Road and Bell Canyon Road. The next day, in a note to Faye, Wayne wrote about his surprise in encountering "a new and different WHNC." "It seems everyone is pulling together to make it a better community for all," he wrote. "I like that."